So I combined these two flavors- of freshly grilled corn on the cob and the bhel ingredients. I also added fresh tender vegetables and a semi ripe mango. I can eat tons of corn bhel, so by cutting down on the corn and adding veggies, I tell myself I am eating a healthy, salad :). And it satisfies my craving for corn bhel without compromising on the taste. The tender vegetables and the sweet and sour mangoes that you find now in the market, make this a perfect spring dish. ¾ cup peeled and diced mango. I chose a semi- ripe, sweet and sour mango. Combine the chat masala, red chili powder, lime juice and sea salt in a bowl. Cut the kernels off the grilled corn and toss them well in the chat masala mixture. To all the chopped veggies and the chopped mango, add a pinch of sea salt and toss with the corn in the bowl. Serve the Corn Bhel Salad, topped with sev. Enjoy! Wishing all mothers a very Happy Mother’s Day! Versatile Blogger Award and Creative Blogger Award !!!!!!!! Happy Mother’s Day Sandhya, the salad looks mouthwatering! Thanks for sharing! Such a tempting stack of colours and ingredients!!! Thank you so much! Love the colors of spring all around us. You make street food looks so fancy! Brilliant recipe and presentation! Thank you so much! This compliment means so much to me coming from a fabulously talented person like you! Yum! The perfect refreshing spring and summer dish! Thank you Loretta! Now that it is nice outside, I love taking pictures outside. This looks not only tempting but the presentation is really gorgeous too! Looks so inviting especially on a hot sunny day like today 🙂 Beautiful presentation and love the recipe. What a medley of colours and so tempting. I have a guest visiting me tomorrow and don’t have time to prepare anything elaborate, I think this corn bhel will do. Thank you for the “light bulb”moment your recipe has induced into my brains. It is a busy’ football party’ season in our neck of the woods. 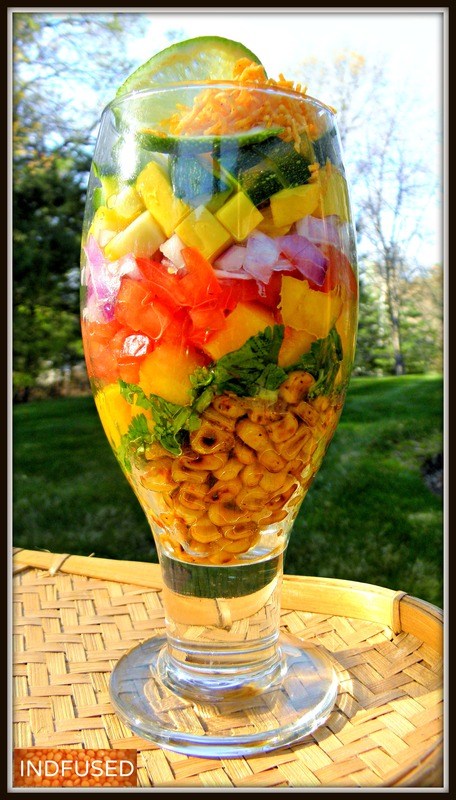 I thought of making this corn bhel salad for the party. You can use frozen corn, roasted or corn on the cob, roasted on the gas stove or under the broiler in the oven. Your post literally teleported me to Juhu chaupati, the sea breeze on the face with the lipsmacking bhel in the hand. Also the winter evenings where on a iron concave plate, glistening with red embers, the corn of your choice would be grilled to perfection smeared with fiery mint chutney and lemon from time to time. This grilled corn bhel salad, houses layers and layers of colour, flavour and yumminess. Just one look at the perfectly grilled corns at the bottom and all the veggies lapped up in lemon juice and chat masala is enough to flood my mouth with water. This is one stunner of a dish with a whole lot of yumminess and goodness. Piyali, thank you so much for the sweet words! You made my day! I try to sneak in some veggies too. I have a ambat goad mango in there too.